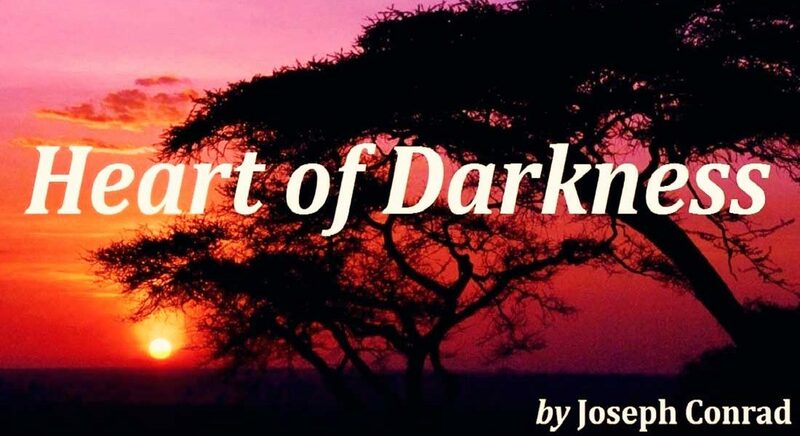 Heart of Darkness narrates the story of a sailor named Marlow, who one day decides to join a naval company that takes him from London to Africa. There he discovers how exotic the African continent is. The narrator refers to it as ‘the darkness’ – the obscure, the indefinable. It is not long before Marlow hears about Mr Kurtz. Kurtz is a well-respected man, who is both admired and feared within the naval company. Even among natives he is a Godlike figure. Slowly but surely, as Marlow approaches the place where Mr Kurz is based, he starts to become increasingly intrigued by this man who is revered by all. As Marlow gets closer to Kurtz, he describes his impressions of dredging through these inhospitable lands. His ‘spirit’ strangely metamorphoses as he faces the hostile surroundings, awkwardly living alongside Africans and fearing at times that they will eat him alive. Against the backdrop of lush yet gloomy landscapes, he also witnesses how the Africans are abused by the ‘pilgrims’ (the Whites) . Moreover, he just does not feel at ease with the company’s hierarchy or with the vicissitudes experienced on the flimsy vessel that they are sailing on. Until he finally meets Kurtz. Here are my thoughts on the book. I will be brief: I was expecting much more. I have to say that indeed I enjoyed the novel at certain points, but given the fact that it is considered one of the great classics of English-speaking literature, and even world literature as a whole, I had greater expectations. I had something much larger in mind. Allow me to expand: the novel is very well ‘written’. The framework is solid, coherent and practically everything falls into place. Loose ends are tied, and the reader can follow the different narrative threads (the river and its metaphorical behaviour play an essential role). Different interesting characters unravel, and, I repeat, the plot uncoils in a coherent way. The story also works because Marlow (who we could say is actually Conrad) is an excellent narrator, a real juggler; almost like that classic night entertainer standing at the centre table of a summer terrace, telling stories as everyone listens in awe. In other words, any good storyteller can write a book like this one. And Conrad was an excellent storyteller. Conrad is actually sharing something he understands to perfection. (Faulkner always advised that it would be better to write about something that one knew very well). When Conrad wrote the novel, he already had a lot of experience at sea (he was over 40 years old), and thus he is actually describing his ‘job’, which is what he knows best. I also think that what makes the novel ‘work’, what gets the reader hooked is the figure of Kurtz – that strange, mysterious man that everyone fears and admires. With this ‘mystery’ surrounding Kurtz, Conrad turns what could have been an ‘open’ biography about Marlow into a novel with an elaborate plot. Moreover, as previously suggested, the main driving force behind Conrad’s work rests above all in the enormous amount of information he probably had right from the beginning, as he was discussing a topic he knew perfectly well. He most probably had a river of anecdotes in his mind and copious documentation before he started writing the novel. All the interesting characters that he had met during his travels at sea were obviously part of that baggage. Which is why the structure of the novel ‘merely’ builds on ordering and linking the pertinent topics (one narrative thread hooking onto the next), on describing the most interesting characters, and on adding the mystery surrounding Kurtz and the halo of ‘darkness’. That is how this book is put together. Additionally, this book also has the structure of a ‘Chinese box’, i.e., a ‘framed narrative’, which entails nothing more than framing one story within the other. Indeed, Marlow is experiencing his storytelling to a crew waiting in London to go out to sea, to whom he narrates his previous journey to Africa, but within that ‘live’ experience it is framed by another story: the mystery surrounding Kurtz. Now let us return to my unfulfilled expectations. Why did I not fully enjoy Heart of Darkness? Among other reasons, because once again I had the impression that it was a very informative book. Yes, it suggests that one can indeed soar into the darkness, but too much is unveiled. What’s more, in certain parts of the book I had the impression that it was being written, very well written, rather than narrated. And perhaps this inkling has a lot to do with the fact, I believe, that Conrad was not actually a thoroughbred Englishman. Joseph was of Ukrainian-Polish origin and had learnt English at the age of 21, which is why I think he is not as fluent as a native speaker would be. So funnily enough, here is a book that may earn brownie points in its translated version and in fact, the Spanish version reads well, it has rhythm and it seems as though the aftertaste that is left after putting pen to paper in the English version significantly wanes.